The piece opens with a dark purple glitter field that connotes outer space as well as elegance, setting the tone for the piece. 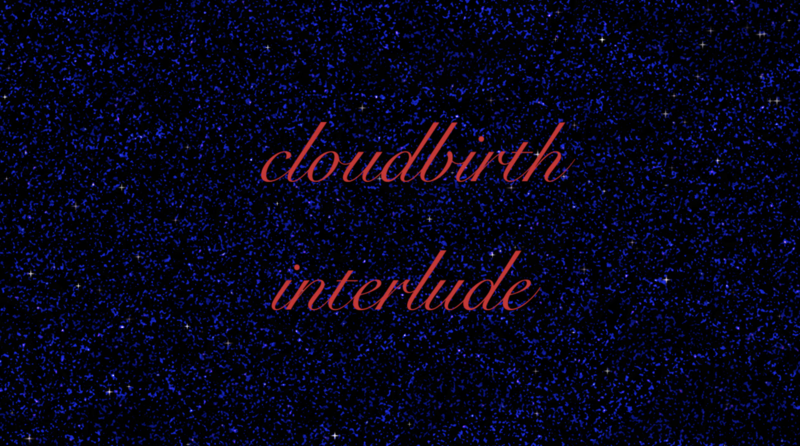 The piece “Cloudbirth Interlude” comes in with a “glittery” sounding synth patch, and as this sound enters, the title of the piece, Cloudbirth Interlude appears in an elegant red font over the glitter field. 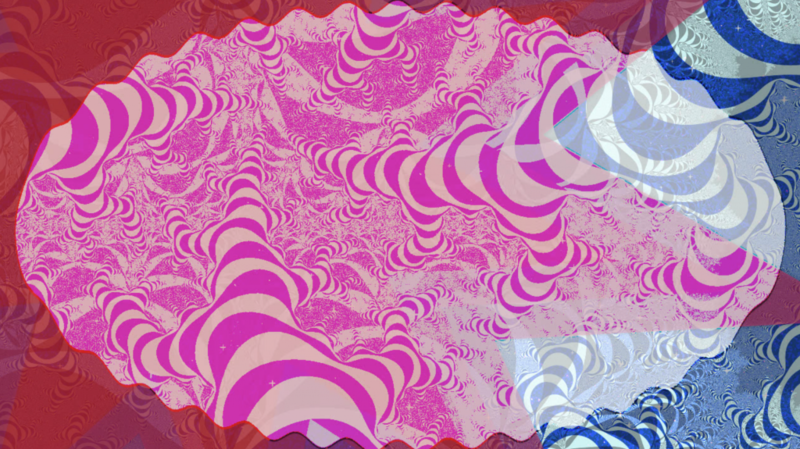 From here, the piece launches into glittery fractals that move across the screen as the music expands. At first, I was almost afraid to use fractals, because of their potential to limit the space and ideas of the piece, but in using them so simply and overtly, as well as in pairing them with the glitter field, I felt satisfied that I was not leaning too hard into the trope of a “fractal space.” The main character of the piece is what I grew to refer to as “the ovules,” which are gray ovular elements that appear in the space and slowly move around. In my first draft of this piece, they had a lot of motion, partially because I was afraid of them becoming stale if they weren’t very active. However, as I edited the piece, I realized the power in the ovules moving slowly, and on their own conditions, even if it felt slower than I thought I “should” have an element move, to keep the piece dynamic. They move around a bit and then rise up, as the next element, red stars are introduced to the piece. 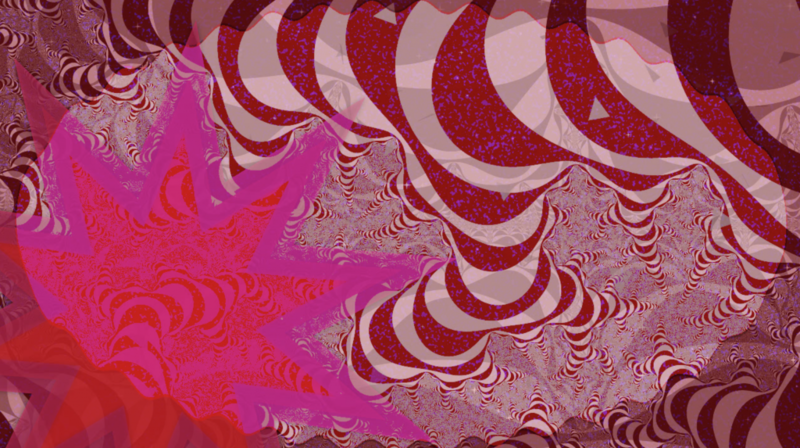 In keeping with the space theme, my other important character in this piece is the red star, that flashes up from the fractal field and out toward the screen. This happens for a few minutes before a particle rain comes down and the screen strobes with a red “light” that eventually takes over and becomes the new backdrop. 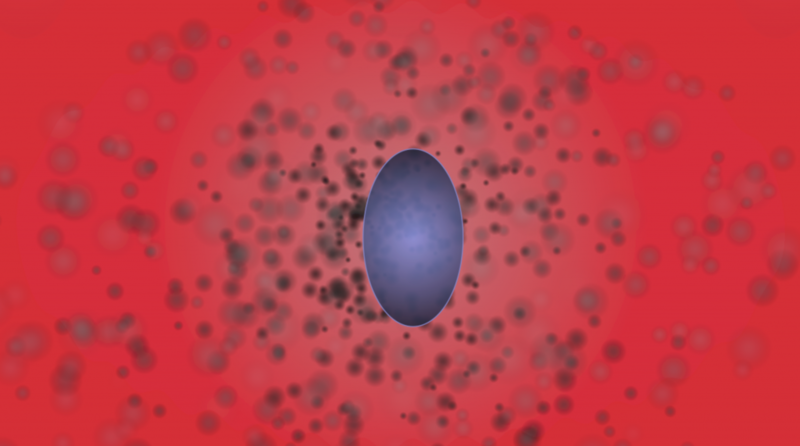 Here, our ovule friend can return, alone this time, and express other ambient sentiments, like rippling, and slowly changing from grey to blue to purple, and slowly swelling — though not without returning to its original form just before its departure. This final section of the piece is one of my favourites because of the “eye,” formed from ovals flashing and shaking. 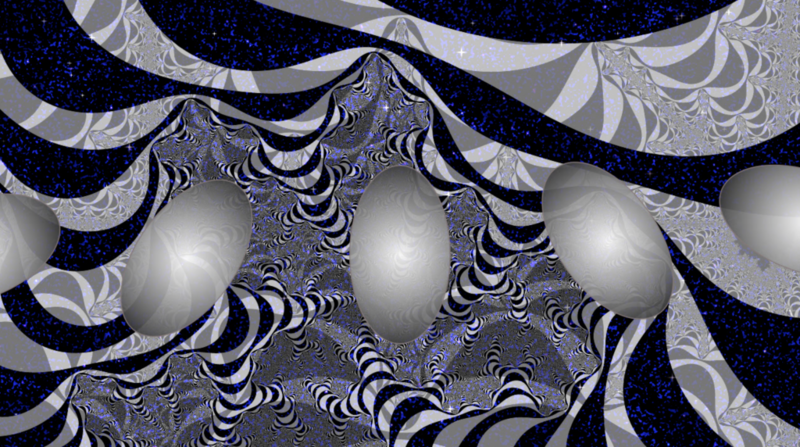 At this point in the video, it is almost the end, but all the elements from the fractal world have found a new iteration to take on, unified by their connection to their original identities, as well as to a unifying color palette, and the grounding of the ovule’s return. As the music comes to a close, this scene “strobes out” and flashes back to the glitter field, which serves to bookend the piece, but also to be functional if I wanted to loop the piece during a live performance. I found the project to be largely successful, considering its intended purpose. While previous work of mine in the class sometimes had a lack of motion that made imagery too stagnant, the nature of this piece was such that motion could be slower and simpler, and my lack of rapid perpetual motion worked as a stylistic choice. In its first draft phase, I felt the need to move the ovule characters, and they ended up taking on a “cuteness” that did not serve the piece. I think the edits I made helped the characters to be confident in their slow pace, and remain true to their identities within the space. That being said, adapting to making a piece that could serve a slightly different purpose that just a video work and allowing the slow pace to live itself out was a challenge, and I think there are still places where the video would benefit from being slowed down even more. One of those places that really sticks out to me is the part where the particle system is spewing from behind the singular ovule. 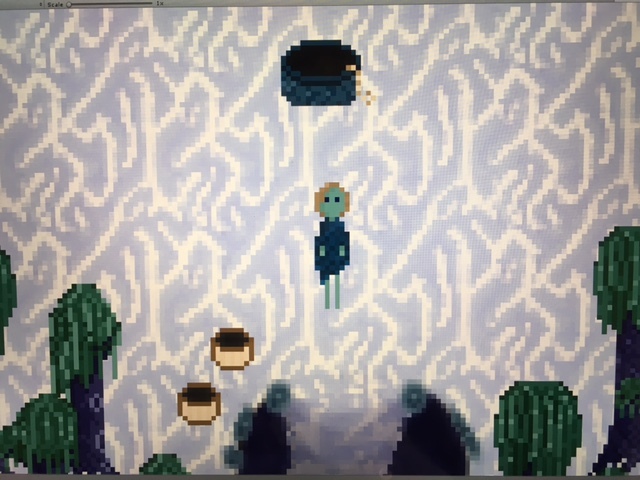 While I love this scene, the particle system is moving too quickly, and I could not figure out the best way to get it to slow down without changing its identity within the space. I guess in this way, the pacing is one of the most successful elements of the piece, but also one of the unsuccessful ones in the places where it did not come across exactly how I wanted, as disruptions in the flow detrimental to this type of piece. As I evaluate how this piece relates to my other work, I think it was one of the first works where my voice and style felt liberated to come through. Not just because of the use of my own music but because I felt justified in building a slow, ambient world, and am starting to see my elements execute themselves with confidence in their identities. The mix of purples and blues and reds and greys set a mood that suited the music and the narrative, and while it was a somewhat limited palette, I never felt like I had to hold back or constrain the ways in which I used them. Similarly, the patterns established by the elements were always interconnected, but not too tightly; the stars find their way back into the piece in a vastly different iteration, as do the ovules, and their ovular backdrop. Motion is the element that is probably the most constrained, as it is super simple, but it feels like I am now developing a sense for when and where elements need to move, in relation to the piece, in order to not become stale. Cloudbirth is really just a first take on visuals that I could project with my music. Until I actually use these visuals at a show, I will not know exactly what elements need to change and what can continue to be thematic in my work, but as I continue this kind of work, I plan on expanding on each of the moods set by the different scenes, playing with how slow and ambient I can let them be, while still introducing enough motion to make them interesting as a backdrop for live music. The element of the large oval with waving edges that appears in the fractal world would ideally become a kind of bright frame around my body at the live shows, with the particles and stars embellishing without detracting from me as the focal point. This project, and the wrapping up of this class tied together all the technical and conceptual skills we had worked on and forced me to start considering my own voice as a digital artist, now that I have a basic understanding of how to structure animation art. After finishing and reviewing the work I did on Cloudbirth, I feel like I have reached a point where I can start building exciting visual narratives to go with my music and other artistic projects.